Probably the most inmersive option would be after killing Alduin. Since, on the beginning only the people of Whiterun know that you are the Dragonborn (the guards recognize you as such, even the Jarl), but it's not enough to actually spread to the other holds, thus the chances of Miraak of discovering you should be low. After being recognized as Dragonborn by the Greybeards could be a good time for some completing the horn quest), but Imo the chances that rumors about you would spread are... slightly bigger, but not enough. Now, after you negotiate the ceasefire between the Imperials and Stormcloaks (and piss off the Thalmor), then more people aknowledge you as the Dragonborn, so your chances would be a lot higher... But right after defeating Alduin, that's where it's perfect for them to hear about you. After all, everyone (*cough* guards) now recognizes you as the one who killed Alduin. Thanks to the creator of this mod! Why is this mod so popular what's the point in delaying the quest? Cause it doens't make sense that the cultists appear at level 10, no matter the stage of the main quest. For me it's immersion related. In my last playthrough, as soon as I came down from the mountain after being summoned by the Graybeards, they were already waiting for me at Dragon Bridge. So... in the time it took me to travel to High Hrothgar, they somehow heard about me all the way in Solstheim, then travelled all the way from there to Skyrim in time to catch me coming down? It just never made a lick of sense. But if you're not into immersion or roleplaying, this may not be relevant to you. Because logically only the people around Whiterun know that you are the Dragonborn, so rumors wouldn't spread fast enough to a remote island. Now, after killing Alduin, every guard in every hold knows what you have done (not to mention that if you negotiated a peace treaty between the Imperials and Stormcloaks, those 2 factions will now be aware that you are Dragonborn), so rumors would logically spread even further to, say, a sailor that casually ends up in Solsthein or something. If anyone was wondering, I installed this AFTER COMPLETING Way of the Voice but before seeing the cultists and it still works. I fast traveled from High Hrothgar to Ivarstead and ran into cultists, so I installed this mod then reloaded the fast travel auto save from High Hrothgar and it's fine. Does this also delay the whole tree stone teleport effect? Or affect the Skaal village (circle ward)? I'd love to enjoy Solstheim before getting into the whole Alduin and Miraak storylines, just be a regular person traveling through Skyrim and Solstheim before getting into the main questlines. From SSEEdit it only affects the start of the DB main Questline - in this case the attack of the cultists is delayed. Although I've never been to Solstheim before the Dragonborn quest, I would have thought the cultists and Mirraak and all that stone business doesn't start until the 'Dragoborn' questline starts. So yeah, I would have thought exploring and doing misc quests in Solstheim is fine to do. I tried sleeping in Soltheim after using the Alternate Start of being a Dunmer refugee in Revan Rock and was still teleported. I know that on your other mod you said that if you go to the castle the quest will start. does the same apply to this mod? can i just go to solthiem and start the quest earlier than i set it to? I think you need to have done way of the voice and be above lvl 25 and travel to solsteim for the dragonborn storyline to start. I could be wrong but im pretty sure its lvl. 25.
so i can just start the quest whenever I want (after the way of the voice and lvl 25),but the cultists wont find me untill the time that that I set. am i understanding it correctly? I believe thats the case yes, like dawnguard even if youve set it so that the quest wont begin till say lvl 80, you can start whenever you want by going to fort dawnguard. I believe dragonborn is similar, travel to solsteim at lvl 25+ (and completing way of the voice also), the quest will begin. if im wrong on that im sure someone will post. I think you need the cultists to attack you in a city to drop the note to start the quest, and this mod disables that until the specified time. Finishing "Way of the Voice", being level 25 and visiting solstheim does not seem to trigger the main Dragonborn DLC quest. Maybe there is an NPC in Solstheim I need to talk to in order to trigger the main Dragonborn DLC quest early? BUT: I didn't finish that particular playthrough, so no guarantee, that it won't cause any issues later in the game. Quick question: I don't use this mod on my main character because I didn't find it until after I had started the quest chain ["Way of the Voice"]. But, had it downloaded for my second one. Some how this mod got enabled for my main character in a save. But, the mod is back off now. Will this cause any problems - or at least - any major problems for my character and the quest(s) involved? I wouldn't have thought so. If the Dragonborn questline has already started for your playthrough after Way of the Voice, then the initial encounter with the cultists has already happened and you'll be getting random cultist attacks. All this mod does is set the trigger for when those events start and since that trigger has passed in your game then it won't do anything drastic if you loaded it in by mistake and then removed it. 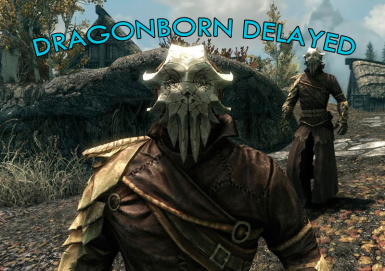 Do you think you can make a file that delays Dragonborn until two or three days after you finish Kindred Judgement (which is the last quest of Dawnguard)? Not sure it can be done, and if so it would need added scripts i would have thought. So, no to that i'm afraid.